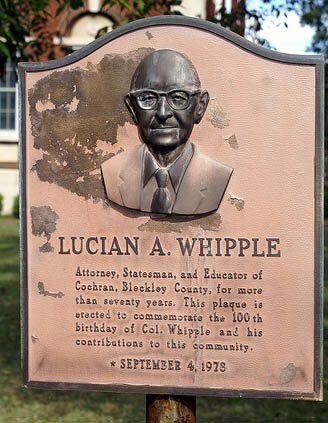 On Friday, September 4th, Col. Lucian A. Whipple, would be one hundred and twenty years old. If he was alive and healthy, he would probably still be practicing law. Next to his family and his community, it was the love of is life - and a long life it was. When Col. Whipple retired, he was the oldest practicing attorney in the United States. He was 98 years old. Lucian Adolphus Whipple was born on September 4, 1878 on the Whipple family farm on Turkey Creek - a few miles east of the present city of Dudley. When the M.D. and S. Railroad came through in 1891, the community was given the name of Whipple's Crossing. Whipple's father, Stephen Bennett Whipple, was of New England stock. The elder Whipple served as an officer in the Confederate Army during the first year of the Civil War. Whipple and his brother Allen were awarded a contract to furnish salt to the Confederacy for the duration of the war. After the war, Whipple went west to California to seek a fortune. Within a year, he returned to Georgia. He bought the James Thomas Place about ten miles west of Dublin. Whipple and his wife, Sarah Holliman Whipple, knew the value of an education. Whipple himself had attended Mercer University before the War. Whipple and his neighbor David Ware built their own schoolhouse. Whipple and Ware chipped in to supplement the teacher's small state salary. Whipple decided to move to Cochran where the New Ebenezer Baptist Association was located. Whipple left the farm and became one of Cochran's most influential businessmen. Stephen and Sarah raised eight sons. William was a physician. Ulysses V. was Judge of the Cordele Superior Court circuit and a legislator. Allen P. was a teacher and a farmer. Robert L. practiced medicine for fifty eight years and died while administering care to a patient. Clifford was a practicing pharmacist for more than fifty years. Stephen T., the oldest son, never married and worked in the family business for many years. Oliver J. practiced dentistry for more than fifty years. elected senior class president. Whipple graduated with first honors in 1898. From Georgia, Whipple returned to the homeland of his paternal ancestors and enrolled in Harvard University Law School. He graduated from the prestigious school in 1901. Whipple returned to Cochran to set up his law practice. Before he was through, Col. Whipple would practice law for seventy-two years. The title of Colonel was honorary. It was a tradition in the South to give a lawyer the title, which was derived from the days when counties were divided into militia districts. Before and during the Civil War, the militia district provided military security to the county, as well as providing justice of the peace courts and election precincts. I as a second lieutenant in the Quartermaster Corps. After the war's end, Whipple taught one year at Mercer University in Macon. Whipple decided it was time to come home to Cochran. When he came back, he brought his new bride with him. On the last day of the 1919, Col. Whipple and Lella Jackson Dillard were united in marriage. Mrs. Whipple's father, the Rev. Miles Hill Dillard, was a well-known minister in the North Georgia Conference of The Methodist Church. Mrs. Whipple was well educated in the arts. She taught school in Sparks, Oglethorpe, Jackson, and Hawkinsville. Mrs. Whipple was the first principal of Druid Hills High School. legislature until 1945. He was responsible for the law allowing non jury trials in Georgia. The First Baptist Church of Cochran was the beneficiary of Whipple's leadership and generosity. During his life, Col. Whipple served as deacon, church clerk, church treasurer, Sunday school teacher, and Sunday school superintendent. during the War in the Army Air Corps. 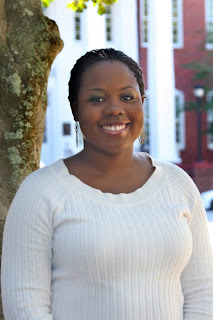 Anne followed in her mother's footsteps, graduating with honors from Wesleyan College and making teaching her career. She married Louis Alderman, well-known educator and former President of Middle Georgia College in Cochran. won his last case. He was ninety eight years old and his health was beginning to fail. During the last two years of his life, he was honored as the oldest alumnus of Harvard School of Law, Middle Georgia College, and the University of Georgia, and the oldest former member of the Georgia House of Representatives. Col.
Whipple passed away on August 24, 1979, eleven days shy of his 101st birthday. QUESTION: To begin, just how has this second year at Georgia Tech progressed for you? ANSWER: Everything has been going real well. We’re 8-1, so we’re winning games, and we have a chance to win the ACC championship if we keep winning games. QUESTION: What is it like just to be around all of this? The atmosphere has been pretty exciting all year. ANSWER: It feels great — and not trying to boast about my old high school football program or anything — but I’m used to winning. So it’s kind of like where last year we were so disappointed about the way we played in the bowl game (a 38-3 loss to LSU in the Chick-fil-A Bowl), we’re really trying hard to make up for it this year. It’s just all about keep moving forward and keep going full steam ahead, just like our motto (this year) says. 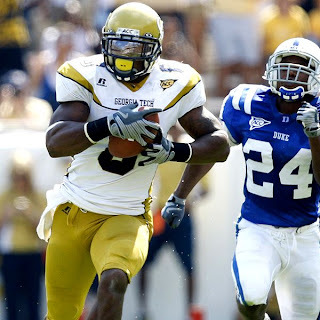 QUESTION: Of course you were one of those players who was recruited when head coach Paul Johnson and his offense first arrived at Georgia Tech. While some recruits thought about avoiding the transition, you stuck with it. Did you foresee this type of season to happen so quickly? ANSWER: I thought we could do well back then. But really, I didn’t think the success would be this early. I thought we’d win games, but not quite like we did last year. But you know, our offensive system is so unique, and not very many people understand how to defend the triple option. It’s a hard offense to defend if you don’t hit the right man and watch your keys. So I knew eventually we were going to have great success, but I really didn’t think it was going to be this early. It’s just been great so far. QUESTION: Nagging injuries and banged up players have been issues lately on the offensive line. Coach Johnson has talked about it just being part of the 10-week straight grind you guys have been under. How has all this affected you, and the rest of the line? ANSWER: We’re holding up pretty good, everyone is getting better and better. I think if somebody goes down, we’ve got good enough players to step up and take their spot. Even the injured players are helping the other players out like us young guys who aren’t playing that much. Everyone has been stepping up and practicing hard, and the whole O-line as a group is getting better. Because, you know, everybody was talking at the beginning of the year about how the O-line was weak, so we just had to show what we were about. QUESTION: You had almost 600 yards of total offense last week, and senior guard Cord Howard and center Sean Bedford have received weekly ACC honors this year. Have you silenced the critics? ANSWER: People are starting to respect us more. We don’t have the respect we want, but we’re starting to get it more and more every week. People are starting to respect our offense and can see that we can put up a lot of points. QUESTION: I’m sure some Georgia Tech fans back in Middle Georgia are jealous that you have shared huddles with players like Josh Nesbitt and Jonathan Dwyer. What do you tell people about playing with guys who could be serious Heisman hopefuls and NFL prospects? ANSWER: It’s great. They’re great people, and they work hard. Nesbitt is silent, but you know when he says something that he means it. People respond to that. He’s a silent leader, but he leads by action. And Dwyer is our best player, so when he gets himself fired up by making a long run, it just gets the energy up for the rest of us. We all feed off him; all the players. QUESTION: Do you still talk to some of your former Dublin teammates? (McRae was part of four Fighting Irish teams that went to the GHSA playoffs. The 2006 team won a co-state championship). ANSWER: Oh yeah, of course. QUESTION: What about Rashard Smith? (Smith starred at quarterback for the Fighting Irish before receiving a scholarship this fall to North Carolina State. A defensive back for the Wolfpack, he was lost for the season after suffering a game-related injury a few weeks ago). ANSWER: I spoke with Rashard earlier in the year when he got hurt, and was telling him to just keep his head up. He’s still young, and just make sure you come back from that injury healthy. Of course he was disappointed, but stuff like that happens. He’s just got to figure out how to respond to it. I know he’s going to bounce back. I know what kind of player he is. QUESTION: Even though Dublin is 7-2, for some down there, this start hasn’t quite been what some fans there are used to. How can you convince them that that there is still a chance they can return to Atlanta and the Georgia Dome this year? ANSWER: I mean, look at my senior year. We lost the opening game to West Laurens. We were almost in the same boat — except it wasn’t two region games. But they can come back and win from two losses. I remember my ninth-grade year, we had three games and we came back and were able to go to the Dome (for the semifinals). Anything is possible; you just have to keep getting better every week. They’ll be fine. Coach (Roger) Holmes is a good coach; he’s going to have them ready. That’s Jep Craig’s take on his longtime friend, F. Scott Beasley. And that sentiment is echoed by many of the townspeople in Dublin, where Mr. Beasley has built up a thriving tire dealership for the past 40 years. So when Mr. Beasley, president of Duncan Tire Co., recently was named the 2009 Tire Dealer Humanitarian Award winner by Tire Business, many viewed it as a testament to the decades of good will and generosity of time and talent he has given to the community. 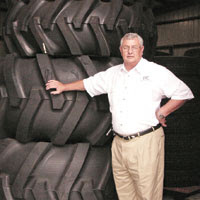 In addition to overseeing the operations of two retail locations and a commercial tire center, Mr. Beasley has served on numerous boards and committees for city and county economic development, the local American Red Cross chapter, the local technical college, the local bank, the local chamber of commerce and the Georgia Tire Dealers & Retreaders Association (GTDRA). He has donated and distributed meal vouchers to the homeless, cooked and given away hundreds of free turkeys at Thanksgiving and Christmas, offered donuts and coffee to St. Patrick’s Day parade participants in front of his dealership every year and sponsored the annual St. Patrick’s Festival golf tournaments, Industry Appreciation Day events and school booster clubs. He also has shared his charity on a personal level by waiving costs for tire and auto service for financially strapped patrons, donating free meals, hiring students fresh out of school and helping out at rescue shelters during a hurricane. As one of many examples, Mr. Craig recalled a visit to Mr. Beasley’s office one day: “He had heard that a family had to take their child 90 miles away for chemo (therapy) in Augusta. And he immediately—I mean without the first hesitation, it was like the second sentence—he told (his store manager and son-in-law) David, ‘We need to find out where that family lives, go get their family car, make sure the tires are good on it, change the oil and make sure that mom can transport that child to chemo and not have to worry about it. Another long-time friend, Don Daily, related how after a Dublin High School football game, late at night, Mr. Beasley opened up his shop to change a flat tire on the car of some teenagers who had traveled to the game. They didn’t have the money to pay for the new tire that night so he let them mail it to him later. A few years ago Mr. Beasley sought help for an employee addicted to drugs. He arranged for the man to enter a treatment program on two different occasions, provided him with clothes and other necessities and kept tabs on him after he moved on to another job. “Had it not been for his tenacity in trying to help this young man, I do not believe ‘John’ would be sober today,” wrote Frank Fields, CEO of River Edge Behavioral Health Center, who assisted Mr. Beasley in finding the treatment programs. “Scott is many-faceted and one facet that truly stands out is his love for his fellow man, no matter their station in life,” wrote Tommy Walker of Walker Tire Co. in Sandersville, Ga., in his recommendation of Mr. Beasley for the award. Mr. Walker related how after his 17-year-old son and his girlfriend died in a car accident, Mr. Beasley, who was scheduled to drive to a convention four hours south of Mr. Walker’s home, instead drove out of his way to visit him and offer his condolences before heading to the convention. “That, to me, speaks volumes of a friend and caring fellow tire dealer,” Mr. Walker said. Mr. Beasley essentially married into the tire business when he decided to work for his father-in-law and dealership founder, Bill Duncan, in 1970. Now his two sons-in-law, David Polhill and Robert Miller, are working with him and sharing in his community involvement. “It’s not that I have to do anything,” Mr. Beasley said. “But when you live in a community and you can go, ‘I’m in my 40th year and 38 of those 40 years have been profitable’—now that’s from the community that has supported Duncan Tire Co.
“So if somebody comes in here and needs some help or needs us to sponsor them or help promote them or be part of that, then we need to try to do that. That is nothing more than pay back. “There are a lot of individuals I’ve done things for that didn’t have anything to do with business. But this town, as far as the growth of this town and this community and this county, is important to me because that is the stability of my business,” he said. He talked with Tire Business while seated in his dealership office with large windows that provide an expansive view of the downtown area he has helped rehabilitate, including the new farmers market building and landscaping next door. “The real motivation would be if I can do it, then my family, my daughters and my sons-in-law, maybe will see what it takes or maybe they’ll see what happens when you become involved. “You can’t sit on the park bench. You just can’t sit on the park bench and just be there.… Somebody built the park and built the park bench. You got to give a hand to help these people whether it’s one-on-one or whether it’s being part of a board that’s helping somebody,” he said. “He is truly the type of individual a community has to have in order for volunteer organizations to go forward,” said Johnny Payne, who worked with Mr. Beasley as a volunteer basketball league referee. Those who know him praise Mr. Beasley’s friendly personality. “He has a huge heart. He’ll do anything for anybody,” Mr. Miller said. “It doesn’t matter who you are, he’s going to treat you the same. He’s going to give you help, whether it’s the Red Cross or helping out veterans,” Mr. Polhill added. He added, “Scott does not brag about what he does. And he gets other people involved.” Mr. Craig gave an example of when Mr. Beasley started distributing meal vouchers to the homeless last year. Mr. Beasley was chosen for the Tire Dealer Humanitarian Award by judges from the United Way of Summit County (Ohio) Volunteer Center in Akron, which promotes volunteerism in local communities. Tire Business presented Mr. Beasley with the 16th annual Tire Dealer Humanitarian Award—an engraved medal and a $1,000 donation to a charity of his choice—during the Tire Industry Association’s “Tire Industry Honors” event Nov. 2 on the eve of the Specialty Equipment Market Association (SEMA) Show in Las Vegas. Mr. Beasley said he is giving the award donation to the GTDRA Foundation, which awards scholarships every year to qualifying association member employees or their children. Mr. Beasley continues to be involved with the foundation he helped create about 20 years ago, serving on the board of trustees and helping raise funds from association members during the group’s annual meetings. Mr. Beasley has served as president, vice president and treasurer of the GTDRA, as well as having held a seat on the board of directors. His sons-in-law are now involved in the leadership of the association with Mr. Miller as president and Mr. Polhill as second vice president. After reading a series of newspaper articles on Dublin’s homeless population last fall, “Scott said, ‘You know, we need to see if there’s something we can do,’” Mr. Miller recalled. “He decided what we would do as a business is we’ll go out to a couple of different restaurants and buy some meal coupons. That lets you take the coupon in there and you get a hot meal,” he said. A couple of buffet-style restaurants gave the dealership a fair price on more than $2,000 worth of coupons, according to Mr. Miller. Local law enforcement officials drove Mr. Beasley around the county in December to where they knew the homeless stayed so he could hand out about 100 coupons. In addition to the dealership employees, a couple of churches donated some money to offset the cost of the coupons. “It was a little something that got folks involved,” he said. While distributing coupons, Mr. Beasley also paid a past-due electric bill for a local non-profit shelter for homeless veterans. Mr. Beasley served as chairman of the Downtown Development Authority in 2006-07 and was instrumental in the construction of the town’s Market on Madison, an open-air multipurpose structure that houses a farmers market, meetings and other events near downtown. He donated shrubbery to be planted on the grounds. He also was “instrumental” in ensuring that a downtown parking lot was repaved and outfitted with lights to make it safer for downtown shoppers, according to the Authority’s Ms. Jones. After his stint with the city development board, Mr. Beasley was appointed vice chairman and is serving as secretary-treasurer of the county industrial development authority that tries to lure new business and industry into the area. He served as chairman of the Dublin-Laurens County Chamber of Commerce in 1997 and is still active with the organization, according to Chamber President Willie Paulk. Under his leadership, the chamber began an annual retreat that involves 50 people who meet for two days to discuss how to improve the community. Mr. Beasley also was involved with the chamber’s long-range planning committee when it decided to build a 3,500-sq.-ft. conference center to host chamber and development authority meetings as well as outside social events. Mr. Beasley chaired a fundraising committee to raise money for the facility, which opened in 2006. “He’s a very generous person, not only of his time and talent but through his business as well. He’s always trying to help others. When he believes in something, he gives it 200 percent,” Ms. Paulk said. Mr. Craig, vice president of economic development for the Heart of Georgia Technical College in Dublin, called Mr. Beasley “an enormous proponent of technical education.” He served on the college’s auto mechanic advisory committee that comprises four to five business owners who meet twice a year. They review the curriculum and the automotive equipment used at the school and make recommendations for any upgrades or changes. “We try to have our students one step ahead of the industry, that way it is much easier for them to get placement,” Mr. Craig said. The school’s diesel department is the only ASE-certified program in the state, he said, and the automotive repair program is undergoing the review process for its certification. Mr. Beasley has been involved with the program for the past 10 years, and after serving on the advisory committee he has recommended some of his employees to serve on the board at different times. He has hired some of its students and has sent employees to the school for training, which he pays for if they pass the class. Mr. Beasley was “a very active” board member of the local American Red Cross during his term in 1998-2000. When he joined, the local chapter was planning to close. With Mr. Beasley’s involvement, the board conducted active fundraising to keep the chapter afloat, according to the Magnolia Midlands Chapter’s executive director, Debbie Wynn. In 1999, when Hurricane Floyd spurred one of the largest evacuations along the U.S. coast, many sought refuge in the Dublin area where the Red Cross set up several shelters. “Scott and his wife went over to one of our shelters and helped with the meals, without me knowing it until later,” Ms. Wynn said. The couple helped serve meals, bring supplies and run errands.Even after his stint on the board, Mr. Beasley continues to be involved. During the 1980s Mr. Beasley, a former high school basketball player, was a volunteer referee for an interdenominational church basketball league that provided a venue for high school students who weren’t on school teams. Mr. Beasley was one of three officials who refereed two or three games a night, three days a week. “We tried to do everything in the spirit of unity and the officials were a key part of it,” said Mr. Payne, who organized the league from 1980-89. He said he could remember only one time when Mr. Beasley called him to say he couldn’t referee a game night. “So he rearranged his schedule in such a manner, as the professional that he is, so that he could be this volunteer for no compensation except within the heart and in the mind. That, to me, is what a true volunteer is and he exemplified that in his mannerisms,” Mr. Payne said. “Refereeing basketball was one of the hardest things I’ve ever done in my life,” Mr. Beasley said, noting that it wasn’t just because of the need for physical stamina, but for emotional stamina when dealing with overzealous parents on the sidelines. As if he wasn’t busy enough, Mr. Beasley has begun a new venture—training to become a court-appointed special advocate (CASA) for the juvenile court system. Once his many hours of training are complete, he will serve as an advocate for children who come under court monitoring, usually due to abuse or neglect. “They call you to be a witness to how visitations are going between children and parents, between children and children, or between the court system and children or between (the child welfare agency) and children. You got to be a mentor,” Mr. Beasley said. “Why I do it is because I think I did a decent job with my own two children and hope to get a chance to be a mentor for my grandchildren…. CASA is strictly volunteers. I think it’s because I feel good about how I raised my children that I could share something relevant with a parent,” he said. “The last place we need to be sending people is to prison. We need to find some help for these children. If you volunteer you can start with young folks and maybe make a change. And that’s the reason I like CASA,” Mr. Beasley said. “I’m not the person that can sit out here and write a check for a lot of money to do this or do that. But my time and a little effort to help people—I feel like that’s what I have to do. “This community has supported me for 40 years. 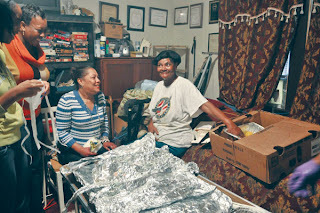 My family will continue to support the community,” Mr. Beasley said. How does he find the time for all his activities? But first and foremost, Mr. Beasley is devoted to his wife, Lynn, whom he married 39 years ago. “She is my best partner. Anything that I’ve done, she has signed off on. Whenever I’m doing something I feel like, first and foremost, I got to represent my family. 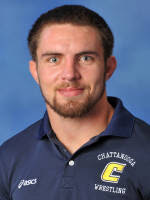 CHATTANOOGA: Two-time NCAA qualifier and one of five returning SoCon champions ... should be a strong competitor for the Mocs at 157. 2008-09 • JUNIOR SEASON: Southern Conference Champion at 157 ... All-Southern Conference ... NCAA qualifier ... finished with a 21-12 record ... 3-1 in SoCon matches ... spent part of the season ranked in the top-20 ... nine of his 12 loses came against NCAA qualifiers ... third place at the Kaufman Brand Open in Omaha, Neb. 2007-08 • SOPHOMORE SEASON: Wrestled at 149 with a 21-11 overall record ... NCAA Qualifier ... was 10-4 in duals ... second on the team with 13 decisions to go with four major decisions and four pins, which tied for second on the team ... fourth place at Midlands defeating No. 4 Brandon Carter (Central Mich.) and No. 3 Mitch Mueller (Iowa State) along the way ... defeated then-No. 9 Will Rowe at Oklahoma 6-0...finished second at SoCon Championships. 2006-07 • FRESHMAN SEASON: Registered a 4-4 mark wrestling at 149 and 157 pounds ... All competition came in tournaments ... Was 2-2 at the Missouri Open with victories over Mark Dickman and Central Oklahoma's Wes Ruth ... At the Southern Scuffle, scored a 10-1 major decision over Boise State and pinned a UNC Greensboro wrestler. 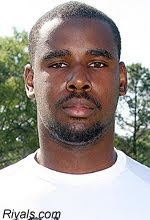 2005-06: Redshirted his first collegiate season with the Mocs. HIGH SCHOOL DUBLIN : State Champion as a junior and senior ... Placed second as a sophomore and fourth as a freshman ... An eighth-place finisher at Junior Nationals in back-to-back years. PERSONAL: Joseph Kenneth Knox ... Born Feb. 20, 1986 ... Son of Susan Cremering and Mike Knox. The Namesake of Brantley County, Ga.
Nearly every county in Georgia is named after a president, state-wide elected official, Indian chief, military officer/hero, physician, or lawyer. This is a story of a self-made man who was honored by the state of Georgia, which named one of its last counties in his honor. On August 14, 1920, the new county of Brantley was created and named in honor of one of Pierce County's founding fathers and leading citizens, Benjamin D. Brantley (formerly of Laurens County.) Brantley County was carved out of the larger counties of Pierce, Wayne, and Charlton. Brantley joined Gov. George M. Troup and James Walker Fannin as the only Laurens Countians to have Georgia counties named in their honor. Benjamin Daniel Brantley was born on January 14, 1832 in Laurens County, a son of Benjamin Brantley and Elizabeth Daniel. Brantley's family came to Laurens County from North Carolina. His mother grew up in Laurens County. Born into a somewhat meager existence, his life was forever changed by the death of his father when Benjamin was only a few weeks old. Benjamin was originally born with the name of Joseph, in honor of his paternal grandfather. His name was changed to Benjamin Daniel in honor of his father and his mother's maiden name. About five years after Benjamin Brantley's death, Mrs. Brantley and her three children moved to Montgomery County. Benjamin spent his early years working on the farm and learning the value of hard work. As he approached manhood, Brantley followed his brother William to Ware County where he worked as a clerk in his brother's store. Benjamin's sister married Judge John McRae, the founder of Alamo, Georgia. Benjamin married Jennette McRae, daughter of Christopher and Christian McCrimmon McRae. To this marriage were born seven children: Christian, Margaret, William, Archibald, Benjamin, John, and Jeanette. Benjamin Brantley moved to Blackshear in Pierce County in 1857. He entered into a business partnership with Alex Douglas under the firm name of Brantley and Douglas. Brantley wisely got in on the ground floor in Blackshear just before the railroad came and established the town as a regional trading center. Brantley enlisted in the 4th Georgia Cavalry during the Civil War. He resigned from the service in 1864 when he was elected Clerk of the Superior Court of Pierce County for one four-year term. In 1870, he entered into a new partnership under the name of Brantley and Company with William Sessions, Judge of the Brunswick Circuit. In 1873, Brantley was elected to represent Pierce County in the Georgia legislature. He served as County Treasurer, for eighteen years beginning in 1876. After Judge Sessions moved to Marietta and left the firm in 1878, Benjamin Brantley went into business with his sons, William and Archibald. William was admitted to the bar and Benjamin, Jr. took his place. The firm conducted business under the name of the A.P. Brantley Company. The company was a diversified one, conducting a bank, an oil mill, a tobacco warehouse, a potato warehouse, a cotton gin, a fertilizer plant, a general store, and several large farms. Benjamin Daniel Brantley died at his home in Blackshear, Georgia on March 18, 1891. Interestingly, his home town was named in honor of the venerable Gen. David Blackshear of Laurens County. Benjamin Brantley, with only a meager education, knew the value of agriculture and timber in his community. He built and operated the first turpentine still in Pierce County. He was also a leader in the industrial, religious, and educational progress of his county. He was known to be a man of outstanding man of moral character - never drinking or smoking and never knowing one playing card from the other. Just what accomplishments Brantley would have made to his county had he lived beyond his 59 years will never be known. William Gordon Brantley, son of Benjamin D. Brantley, graduated from the University of Georgia. He studied law in the office of former Congressman, John C. Nichols. At the age of twenty two, he was elected to the Georgia House of Representatives. He grew a mustache to make him look older and shaved it off after the election. After two terms, the young Brantley was elected to the State Senate and at the age of twenty six, was elected its president. He served as Solicitor General of the Brunswick Circuit for eight years. In 1896, William G. Brantley was elected to the United States Congress from the old 11th District and served for sixteen years without opposition until 1913. William Brantley served on the powerful Judiciary and Ways & Means Committees. Cong. Brantley was instrumental in the building of the brick post office on East Madison Street in Dublin and in improvements made to Georgia's rivers, including the improvement of the navigation of the Oconee River. William Brantley left the Congress in 1913 to set up a private law practice in Atlanta. Washington remained in Brantley's blood and after a short stay in Georgia, he returned to the capital city. Brantley became associated with the Federal evaluation of southern railroads. He also served as vice president and general counsel of the Fruit Growers Express Company and the Burlington Express Company. W.G. Brantley died in Washington, D.C. on September 12, 1934. His body was returned home for burial in Blackshear. Among the wreaths of flowers was one sent by Franklin D. and Eleanor Roosevelt. The story of Benjamin Daniel Brantley and his son, William Gordon Brantley, is one which has been lost to those of us in Laurens County, but which has become an important part of the histories of Pierce and Brantley Counties. Benjamin Brantley was justly honored by our state. He represented all of those men and women who dedicated their lives to the development of our state following the Civil War. 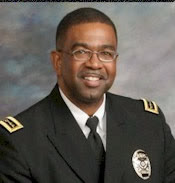 Sheriff Ira Edwards, Jr. was born in Dublin, Georgia to the proud parents of the Reverend and Mrs. Ira Edwards, Sr. 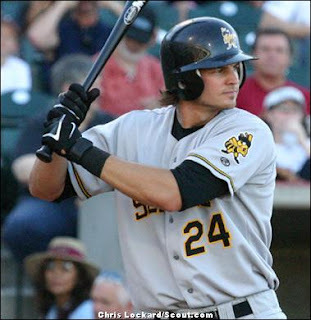 He is the seventh child of eight siblings and is a graduate of the University of Georgia where he received his B.S. Degree in Sociology with a focus in Criminal Studies. He received his Masters in Public Administration at Columbus State University and is a graduate of the National Sheriff s’ Institute where he was nominated class president. He is a graduate of the Georgia International Law Enforcement Exchange in Tel-Aviv, Israel, and also an Executive Certified Instructor for the National Sheriffs’ Association Homeland Security. Sheriff Edwards is a member of the Pi Alpha Alpha Honor Society and the Grand Boule Delta Chapter Sigma Pi Phi. Sheriff Edwards is a 23-year law enforcement veteran, beginning his career with the Clarke County Sheriff’s Office in 1985. He would later transfer to the City of Athens Police Department where he served until he was elected as the first African American Sheriff of Clarke County. He also became the first African American to win a county- wide election in Clarke County. He is now serving his third term as Sheriff of Clarke County. One of Sheriff Edwards’ proudest accomplishments was when the Clarke County Sheriff’s Office became the recipient of the 2007 State of Georgia Law Enforcement Certification, becoming the 10th Sheriff’s Office in the State of Georgia to receive this prestigious award. This milestone was the first time in history for the Clarke County Sheriffs’ Office. Sheriff Edwards has served in many capacities as a community servant and leader. Some of these capacities include: Co-hosted 2007 & 2008 Community Event, “Evening of Inspiration & Hope”, featuring renown speakers, Dr. Ben Carson and Dr. Wintley Phipps; Hosted 2002 & 2006 State D.A.R.E. 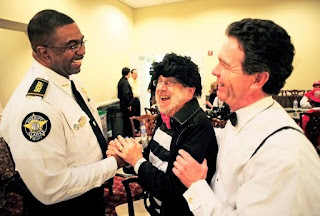 Conference; Host annual Sheriff Edwards’ Charity Ride for youth; Clarke County School District Adopt a School Partnership; Boy’s Book Club Partnership with UGA Basketball Team and Fowler Drive Elementary School; and motivational speaker for youth groups. Sheriff Edwards has served on several committees on a local, state, and national level. Some of these committees include: 2008 Appointee to the D.A.R.E. International Executive Law Enforcement Advisory Board, Chairman for the National Sheriffs’ Association Chaplain’s Committee, Board Member and Past President for the Georgia Sheriffs’ Youth Homes, President for Peace Officers for Christ of N.E. Georgia, Board Member for the Domestic Task Force, and Executive Board Member for the Boy Scouts of N.E. Georgia. Sheriff Edwards is happily married to Teresa Pearson Edwards of 25 years and have three children: Lamar, Brandon, and Jasmine. He is also an ordained Elder at Timothy Baptist Church here in Athens. From Athens-Clarke County Sheriff's website. http://www.clarkecountysheriff.org/. Regina Holliday loves animal agriculture. A native of Dublin, Ga., she began showing beef cattle at an early age. When she joined FFA in ninth grade, beef quickly became the focus of her supervised agricultural experience program, and it’s continued to grow. Regina’s career goal is to finish her undergraduate degree at the University of Georgia and eventually become a veterinarian. But for now, she’s enjoying her year traveling the country as the National FFA Southern Region Vice President. Learn more about Regina. Q What is your favorite part about being a college student? A I love life at the University of Georgia! The best part about being a college student is getting to meet new people. Trust me; in a lecture hall of more than 400 students, you meet somebody new every day! Really, I was afraid of not being around people who were familiar to me. You get to college and you meet so many people that have the same interests as you. If you ever need a study buddy or just need a friend, you are certain to find somebody. Q Why should FFA members consider joining Collegiate FFA after they finish high school? A Collegiate FFA is a great way to continue involvement in such a great organization. You may go to schools outside of your state, but you continue to work with individuals who have the same belief in agriculture. Plus, it helps give you a heads up on what is going and how we as agriculturalists can help educate people on things that affect our everyday lives. Q Animal agriculture is under attack by a lot of organizations. As a beef cattle producer and FFA member, what do you tell people when asked about our nation’s food supply and its safety? A We have one of the safest – if not the safest – food supply in the world. Quite often, people don’t fully understand the issues in agriculture, so it’s important to educate people about our industry. That education starts as FFA members in our local communities and can even extend to our collegiate careers and beyond. 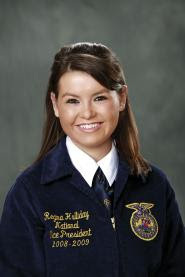 Q A lot of other FFA members, like you, want to become veterinarians. What steps are you taking to prepare yourself for this career? A I have realized the important of maintaining good grades, so studying is a must for me. The average GPA to get into vet school is a 3.8, so I have to hit the books! I also think it is important to build relationships with faculty and staff at your college or university. My advisor at UGA has been instrumental in helping me take the required courses and developing a plan of action so that I can go into vet school. And when in doubt about something, just ask. Q Do you have a quote or saying you live by or that fits what you are currently experiencing as a national officer? Karl Slover has spent most of his 91 years as a movie star. Seventy years ago at the pinnacle of his career, Karl Slover went virtually unnoticed in a newly released movie from MGM. The movie, The Wizard Oz, based on novels by L. Frank Baum is considered one of the most endearing films of all time. Last Saturday night at theater Dublin, one can see why. When the film premiered at Graumann's Chinese Theater in August 1939, hardly anyone noticed Karl among the one hundred and twenty five other midgets and children playing Munchkins. 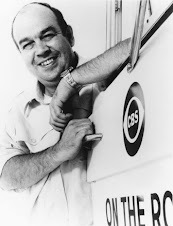 It wasn't until fifty years later, when Karl, a resident of the Sheridan in Dublin, and his fellow Munchkins were accorded the fame they so richly deserved , a recognition which climaxed with the placing of a star on the Hollywood Walk of Fame in November 2007. Karl had spent the earlier part of the day at Market on Madison signing autographs and having his picture taken with sixty year old fans and some nervous toddlers. Tim Herrington and his daughter Heather, cultivators of prize winning day lillies, stopped by to meet Karl and have him sign a photograph of one of their best varieties of Oz themed lillies. 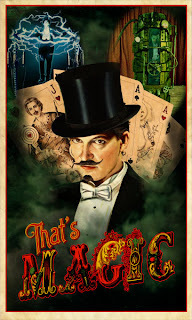 The event was organized by Kathy Jones, Dublin Main Street director, to coincide with the performance of the play by the Emerald City Character Company at Theater Dublin. The days activities included some of characters of the cast and carriage ride on a horse of a different color. Before the last of three performances of the play directed by ECCC director, Chris Ikner, Karl was back at his card table signing and posing. When the lights came up on the brilliantly decorated set of Munchkinland, some eyes turned to Karl as he sat on the front of his seat, smiling and remembering the months seven decades ago when he was on a sound stage in Hollywood playing the role of the first trumpeter, a sleepy head, a soldier and one of the Munchkins who guided Dorothy down the Yellow Brick Road. After the cast of local actors took their well deserved bows, Karl was honored with the presentation of one of posters for the event and invited to lead the four hundred plus members of the audience and ensemble in singing "We're Off To See The Wizard." Karl commented, "It was wonderful to see those kids on the stage playing the part I once did." James Milton Smith, Jr. was born in Twiggs County, Georgia on October 24, 1823. Smith grew up in on the family farm, where he learned to plant cotton and corn. As a young man, Smith became proficient in the art of black smithing. 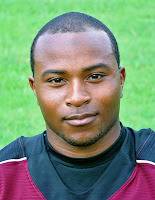 Many thought he was the best "smithy" in the area. Smith attended school at Culloden in Monroe County. Smith became infatuated with the law and set out to make it his life's profession. At the age of twenty three, Smith was admitted to the bar, moved to Thomaston, and set up a successful practice. In his first try for political office, Smith lost the congressional election of 1855. When the War Between the States broke out in 1861, Smith was elected Captain of D of the 13th Georgia Infantry, the Upson County Volunteers, on July 8, 1861. That same day, Capt. Smith was elected as Major of the regiment. On February 1, 1862, Maj. Smith was elected Lt. Colonel of the 13th Georgia Infantry. On the second day of the Seven Days Battles around Richmond, Virginia, Lt. Col. Smith received a severe wound at Cold Harbor, Virginia. During Lee's push to the north in September of 1862, Col. Smith and his regiment became heavily engaged in the Battle of Sharpsburg (or Antietam.) That day, September 17, 1862, was the bloodiest in the history of our country. Over 22,000 men were killed, wounded, or captured. One of those killed was Col. Marcellus Douglas commanding the 13th Georgia Infantry. The Brigade commander promoted James Smith to Colonel on the battlefield. Smith resigned his commission on December 14, 1863 due to his disability. Colonel Smith was elected to the Confederate Congress and served from May of 1864 until the end of the war. After the war Smith returned home and formed a law partnership with Peter W. Alexander in Columbus. Smith spoke out publicly against the reconstruction policies of the Federal government. 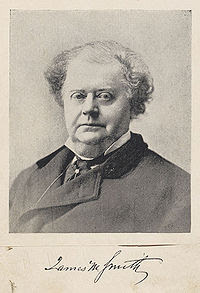 Smith, at the urging of many of his friends, decided to enter the political ring in 1870. This time he was successful. As the new state representative from Muscogee County, he quickly rose to the leadership of the house. In December of 1871, Rep. Smith was elected as Speaker of the House, garnering 135 out of 157 votes. Gov. Rufus Brown Bullock's resignation left the office of Governor vacant. Smith, the new leader of the Democrats, was chosen to run in a special election. When the Republican candidate dropped out of the race, Smith became Governor with no opposition. Gov. Smith entered office after the tumultuous years of Reconstruction. State finances were in shambles. The Governor instituted a policy of fiscal conservatism. The state's credit rating was increased and when Smith left office there was a surplus in the treasury. One of Smith's attributes was his ability to choose men of outstanding ability. Among those were school superintendent Gustavas J. Orr, and Supreme Court justices James Jackson and Logan Bleckley. In 1872, Gov. Smith was elected to serve a full four-year term. During Smith's term as governor, new government agencies to aid Georgia farmers were created. The Agriculture School at the University of Georgia was established. In 1874, the Agriculture and Geology departments were created. In 1877, Gov. Smith ran for the Senate of the United States. With the backing of former Civil War era governor, Joseph E. Brown, and Gen. John B. Gordon, Smith had a good chance. Smith bowed out of the race in favor of Benjamin Harvey Hill. As a sort of consolation prize, Col. Colquitt appointed James Smith as the first chairman of the Railroad Commission in 1879. Commissioner Smith served a six-year term and returned to his law practice in Columbus. In May of 1887, James Smith was appointed a judge of the Superior Court of the Chattahoochee Judicial Circuit, by his good friend, Gov. John B. Gordon. Smith left his lucrative practice to take the office of Superior Court Judge, a position of great honor. Smith was elected to a four year term in the 1888 election. Judge Smith suffered a stroke in 1890 and died on November 25, 1890 after a long illness. Gov. Smith was buried in the Alta Vista Cemetery in Gainesville, Georgia, beside of his first wife, Hester Ann Brown Smith. Gov. Smith was criticized by many for his association with the "Bourbon" faction of Georgia politics. While he did agree with the Bourbons, Smith did not practice all of their policies, especially the economic ones. Gov. Smith held strong opinions and often expressed them. His outspokenness was often resented, but overall, he was a popular governor of Georgia in its "Coming of Out The Dark Period." The Atlanta Constitution" described Gov. Smith as "one of the boldest and most fearless men in the history of Georgia."